Escuche a los Amador en Acción: Vea nuestros demos en video aquí. LOS AMADOR - Video promocional en español de Locuciones Bilingües Amador. Producido por el Boston University AdLab. Bilingual voice actor Rosi Amador voices this Acer Computers commercial for cinema pre-roll in Mexico. Produced by Rational Agency. Bilingual voice actor Brian Amador voices the Spanish tagline of this Acer Computers commercial for cinema pre-roll in Mexico. Produced by Rational Agency. 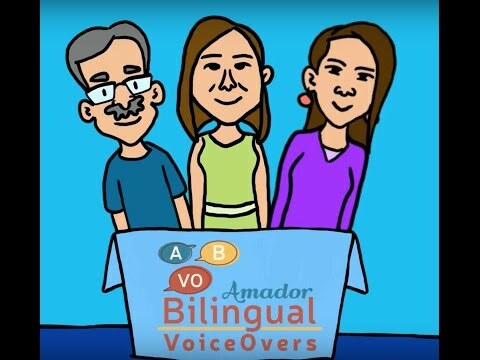 Rosi Amador ~ English and Spanish Voiceover in videos from PBS, Amway, Expedia, Batchbook and more. Brian Amador narrates the Spanish version of the orientation video for the newly-inaugurated Edward M. Kennedy Institute for the Senate of the United States in Boston. Rosi and Brian did ALL the voices in this Spanish overdub for Humana. Web video about water processing. Voiceover by Brian Amador. Overdubs by Rosi, Brian and Alisa Amador - English with Hispanic accent. Brian Amador is the voice of the talking fire hydrant and the courageous little blue robot in this short animated film. Bilingual, Southwestern take on "Little Red Riding Hood". Voices: Rosi and Brian Amador; music & sfx: Brian Amador. Published by Live Oak Media. Online tutorial narrated by Rosi Amador.